8 June 2016: Up to 60% steel saved! 1.3 km of KSP walls on the A1 Coalhouse to MetroCentre Improvement achieved a new milestone, saving 44% steel on average, up to 60% steel on individual walls and 902 tonnes overall. 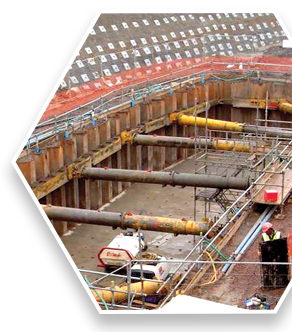 The Arup design for Balfour Beatty included the first permanent works use of KSP walls with two pairs of intermediate piles. 15 September 2015: David Baker presented a paper entitled “King Sheet Piling (KSP) – a fundamental and innovative advance on past sheet piling practice” at the International Society for Soil Mechanics and Geotechnical Engineering’s XVIth European Conference on Soil Mechanics and Geotechnical Engineering in Edinburgh in September, 2015. This prestigious conference attracted over 1,150 delegates made up largely of leading practitioners from 65 countries. 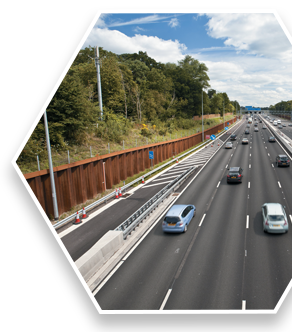 27 July 2015: This summer KSP installations commenced on the following Highways England projects: M3 Junctions 2 to 4A Smart Motorway, Manchester Smart Motorway, M25 Junction 30/A13 Corridor Relieving Congestion Scheme, and A1 Coalhouse to MetroCentre Improvement. 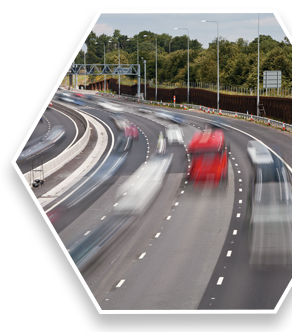 In addition, Highways England awarded the M1 Junctions 19 to 16 Smart Motorway project utilising a KSP reference design. 31st March 2015: The Malaysian IPO granted patent MY – 153800 – A covering the intellectual property rights behind KSP. 17 July 2014: KSP wins Commercial Innovation of the Year Award at the Construction News Awards Ceremony in London. The judges recognised that King Sheet Piling was ‘exceptional’ and ‘more than just innovative’ and that it ‘could revolutionise a practice largely unchanged for 120 years.’ They concluded that it ‘could truly make an impact on a global scale.’ Click here to read more. 23 May 2014: The Hong Kong patent office issued patent HK1160672 covering the IPR behind KSP. 31 March 2014: Balfour Beatty Rail completed installation of sheet piles for a KSP wall to stabilise an unstable Network Rail embankment at Westbury in Wiltshire. 27 March 2014: KSP short-listed for Construction News Company Innovation of the Year award. 20 March 2014: Two-page spread on KSP innovation published in New Civil Engineer. 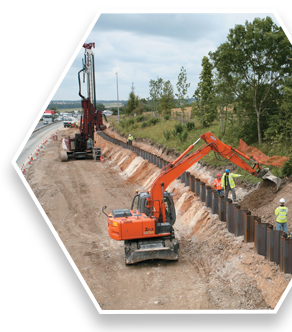 25 November 2013: The use of King Sheet Piling (KSP) on the M25 DBFO widening project is cited as one of four exemplar projects in the Infrastructure Carbon Review published by H M Treasury and Infrastructure UK. Click here to see the announcement and access the report. Information on KSP's success can be found on page 13 of the report. 20 November 2013: The State Intellectual Property Office of the People’s Republic of China today issued Patent No ZL102144065 for King Sheet Piling. 8 November 2013: The design of King Sheet Pile walls for Network Rail on the South East Spur of Crossrail is now at Grip 4. The KSP walls will provide combined temporary and permanent support to a reinforced concrete culvert in soft ground, eliminating the need to pile the culvert. Culvert construction is planned for mid to late 2014. 3 September 2013: King Sheet Pile walls have been used in temporary works on the A11 Fiveways to Thetford improvements. Used in cantilever walls up to 7.5 metres high in chalk, KSP walls have proven their worth with a 30% average steel saving, increased productivity and negligible deflection. 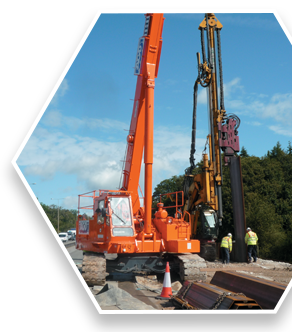 26 August 2013: To read the August 2013 Ground Engineering article on King Sheet Piling use on M4/M5 click here. 22 August 2013: The Chinese patent authority has advised that the King Sheet Piling patent application in China has been approved to proceed to grant. 15 June 2013: The team on Skanska Balfour Beatty JV’s Later Upgraded Sections of the M25 DBFO have maximised efficiency by using surplus stocks of Z and U section piles in KSP walls. 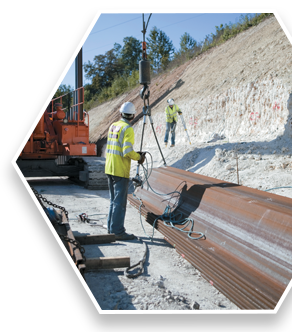 Whilst less efficient than Z piles, use of surplus U piles was a more sustainable solution than purchase of new Z piles. 18 April 2013: Publication date for Construction News Supplement with article on King Sheet Piling (KSP). Click here to download the article. 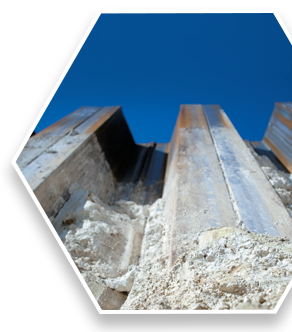 20 February 2013: Publication of grant of UK Patent GB2463079 for King Sheet Piling (KSP), 4.5 years after filing the patent application – a typical timescale for the patenting process. 19 June 2012: Official opening of the M25 major improvement scheme to increase capacity between junctions 16 to 23 and junctions 27 to 30 and refurbish the Hatfield Tunnel. Both widened sections were opened ahead of programme and in plenty of time for the Olympic Games. 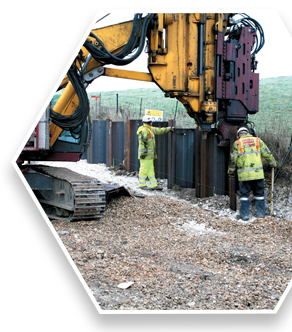 King Sheet Piling (KSP) played a crucial role in de-risking the critical fast-track programme. Click here for more information. 30 November 2012: KSP wins the Constructing Excellence National Innovation Award. The judges said KSP was a ‘genuine Innovation, challenging the status quo and delivering a faster, safer more sustainable solution’. 10 October 2012: KSP was Highly Commended in the Product Innovation Category at the 25th British Construction Industry Awards ceremony in London. 27 September 2012: KSP wins the Constructing Excellence London and South East Innovation Award. 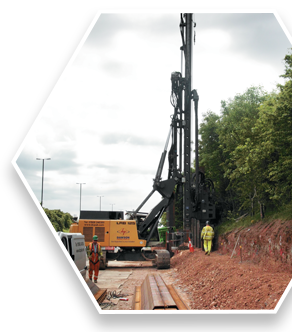 14 June 2012: King Sheet Piling (KSP) won the Chartered Institution of Highways and Transportation Ringway Innovation Award. Inventor David Baker accepted the award from CIHT Patron, Her Royal Highness, The Princess Royal, at a gala dinner in London. The judges enthused over this innovative yet simple idea. Following value engineering, this design modification resulted in large cost savings and greatly increased productivity for this fast-track project. In addition, the reduction in materials used of 30 to 40% has resulted in economic, sustainable and environmental benefits. This novel construction technique significantly reduced the construction time and minimised disruption on a long section of the M25. Judges were also impressed by the communication and consultation between all parties involved which resulted in the use of an untried system on such a major project. Click here to down-load the citation. 11 July 2011: Following a successful trial of installing a short section of KSP wall in weak rock on the M4/M5 Managed Motorway scheme, the system was adopted in the design of a number of Emergency Relief Refuges (ERA). 20 May 2010: Presentation by KSP Inventor, David Baker, on King Sheet Piling (KSP) at Transport for London’s Supplier Innovation day Seminar. TfL invited fifteen of its major suppliers to submit their top two innovations and make the case for how each could benefit TfL’s Business Plan. KSP won one of three places to present at the seminar. 11 March 2010: Publication of PCT (International) patent application No PCT/GB2009/051040 for King Sheet Piling (KSP). 2 September 2008: Publication of UK patent application No GB0815961.8 (GB 2463079 A ) for King Sheet Piling (KSP).